This entry was posted in Real Estate, Truly Rich and tagged Larry Gamboa, Ten Deadliest Mistakes Even Experienced Real Estate Investors Make and How to Avoid Them, Think Rich Pinoy! on May 27, 2013 by Bobet Prudente. Best selling author Dr. Larry Gamboa, after having sold 40,000 paper copies of the Think Rich, Pinoy! 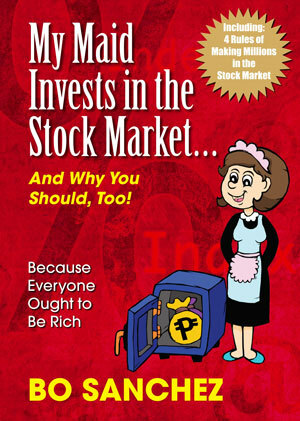 book, released the Think Rich, Pinoy! eBook edition. The Think Rich, Pinoy! E-Book is about to become a phenomenon, and it can really help you make a difference and a fortune with what you’ll learn about real estate investing. The E-Book Think Rich Pinoy is the first prong of a three prong thrust to empower Global Pinoy to learn financial literacy through real estate investing taught by result maven entrepreneurs sharing wisdom from having done it firsthand. This entry was posted in Real Estate, Truly Rich and tagged eBook, financial literacy, Larry Gamboa, Ten Deadliest Mistakes Even Experienced Real Estate Investors Make and How to Avoid Them, Think Rich Pinoy! on May 9, 2013 by Bobet Prudente. Meet Dr. Larry Gamboa, author of Think Rich, Pinoy! 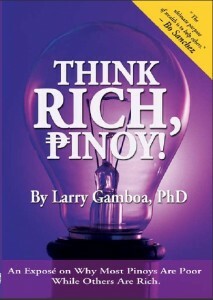 Dr. Larry Gamboa is the best selling author of Think Rich, Pinoy! After I joined the TrulyRichClub and learned he is Bo Sanchez‘ real estate mentor, I read his first book then I quickly looked for his other books (which weren’t exactly easy to find). Lucky I found the eBook editions, so I finished the other three books within two months! I guess one can say that Think Rich Pinoy! is the local adaptation of Robert Kiyosaki’s Rich Dad, Poor Dad. Like Rich Dad, Poor Dad, it does discuss financial literary, but Dr. Larry’s book is much better: it discusses the subject in the context of Philippine setting, and explains it in much clearer and easy to understand way with many and examples Filipinos could relate to. This entry was posted in Real Estate, Success Mentors Collection and tagged Grow Rich Pinoy, Larry Gamboa, Roberto Kiyosaki, Scaleup Your Internet Startup, SGV, Ten Deadliest Mistakes Even Experienced Real Estate Investors Make and How to Avoid Them, Think Rich Pinoy!, Think Rich Quick, Washington Sycip on May 2, 2013 by Bobet Prudente.